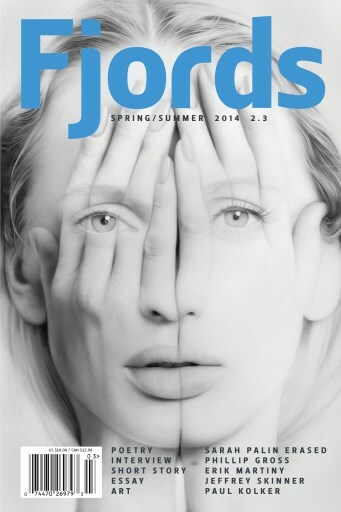 Stunning artwork from Armenian born artist Tigran Tsitoghdzyan is on the cover. His work mixes portraiture and surrealism in a profound way. The Editor’s Choice for the issue is a selection from Cynthia Schwartzberg Edlow’s Super Dan Comics Question Box Series. These sparkling, unexpected, and experimental pieces push the boundaries of what a poem can be. Two penetrating erasure poems by Karin Barbee are taken from Sarah Palin’s autobiography, an interview with British poet Phillip Gross, an About the Poem with Noel Sloboda, an upbeat essay on our lives by Len Messineo and translations of French poet Tony Duvert by S.C. Delaney & Agnès Potier are part of the issues highlights. Also, fabulous poetry from model Chris Campanioni, Alexis Roane Fancher, and Patricia Caspers stand alongside John F. Buckley, Jory Mickelson and Robert Peake. Two sonnets from John Reed begin the issue. Light artist Paul Kolker uses leds and mirrors to create some gorgeous paradoxes.